On Dec. 4, the “Solar Power Systems: Science, Policy and Practicum” environmental studies class hosted a flip-the-switch event and turned on the solar panels installed on the Village Market apartments. 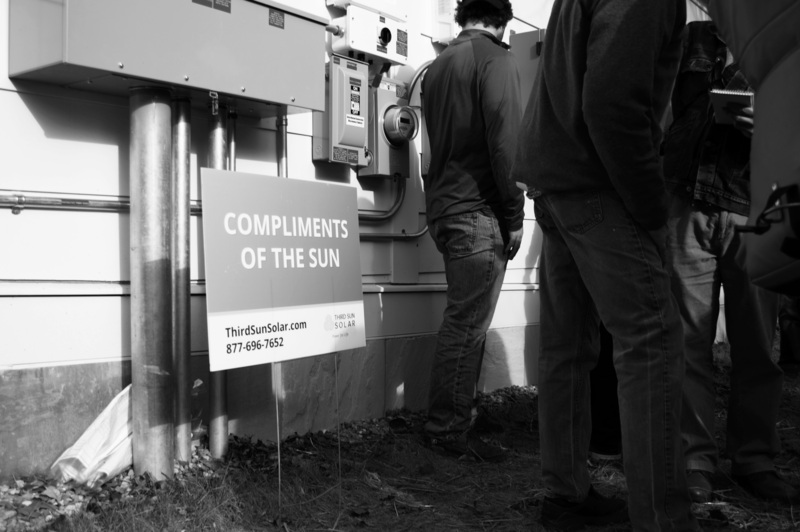 During this public event, members of the class went the system sites to activate the solar panels. “We are building a constellation of solar systems that ultimately, building by building, site by site, will offset a significant share of utility power that normally would be used at that site,” said Jerry Kelly ’96, who co-teaches the course, before the solar panels were generated. Kelly team-teaches this class alongside Assistant Professor of Physics and Scientific Computing Eric Holdener. Previously, Kelly worked for a solar company in Athens, Ohio. He wanted to incorporate solar energy on campus and proposed a course description to the College in 2015, and has been teaching the class for four semesters. Each semester, students investigate locations on campus that could benefit from solar power and are also involved in the installation of projects from the previous semester’s class. “We have been very impressed with the students, with the way that they engage with the information, and with their devotion to the larger concept of clean energy,” Kelly said. In addition to installing those at the Market apartments, in the past semesters, the class also helped install solar panels on the Kenyon Farm in 2015, and the Village Inn in 2017. Although the solar panels will offset some of Gambier’s energy, Kelly said solar energy has several drawbacks. Panels needs a vast space to generate a small amount of energy and the panels do not store energy. On cloudy days, or during the night, solar panels cannot provide energy. Some of the older buildings on campus are not suitable for solar arrays either; buildings need a certain type of infrastructure on the roof and should face the direction it can receive an abundant amount of sunlight. “Solar could be a bridge — over the next 20, 30, 40 years — to get us to the point where we have an even better solution,” Kelly said. The current students are looking into the Kenyon Athletic Center, the Brown Family Environmental Center, the Kenyon Bookstore (the portion under construction) and the Health and Counseling Center as other potential locations for solar panels. “We could point to this and say ‘We did this, this is something that we are doing to help make Kenyon greener,’” Mary Liz Brady ’18, a student in the class, said. Next week, five groups from the current class will present their own projects as part of a requirement for the course; one of these projects will be selected for installment for the upcoming class to flip the switch. “This has been a great class this semester … and all of them have been very interesting, worthwhile endeavours,” Holdener said.